Beta Sigma Phi members from left, Nancy Cobbs, Beryl Hill, Penny Linton, Joyce Wilkerson, Jo Ann Luttgeharm, Peggy Fisher and Mary Jane Kugle with blankets they lovingly create for Houston Methodist St. John patients. The Xi Lambda Rho Chapter of the Clear Creek Bay Area City Council for the Beta Sigma Phil Sorority has been generously serving our community since 1968, but this year the sorority’s service committee decided they wanted to do something a little more memorable. Jo Ann Luttgeharm is one of the newest members of the sorority and along with Penny Linton is co-chair of the service committee. The ladies had the idea to do something “hands on” that the committee could do as a group. With Penny being a first class seamstress, the original idea was to create colorful pillowcases for chronically ill patients at a local hospital, but when Jo Ann called Houston Methodist St. John Hospital to discuss the idea, she spoke with Denise Thomas in Guest Services, who had an even better idea for the group. In fact, a volunteer group who makes the fleece throws for breast cancer patients was meeting that week and the sorority members were invited to join them for the day. Coordinated by Tamara Coy-Tremant, the Project Manager for Houston Methodist St. John Hospital, the group was made up of the breast cancer patients’ friends, family members and other volunteers including 17 members of the sorority service committee. They already had their pink and white fabrics picked out and the group created their first blankets for breast cancer patients. The ladies of Beta Sigma Phi felt privileged to be included since several of their members are breast cancer survivors themselves. As an added touch, the blankets were embroidered with the hospital logo as well as the words “Faith, Hope and Love” Beta Sigma Phi. The ladies were then invited to make a formal presentation of the blankets to Houston Methodist St. John Hospital CEO Dan Newman. In addition to the blankets made for the breast cancer patients, the ladies have made additional blankets for other patients. 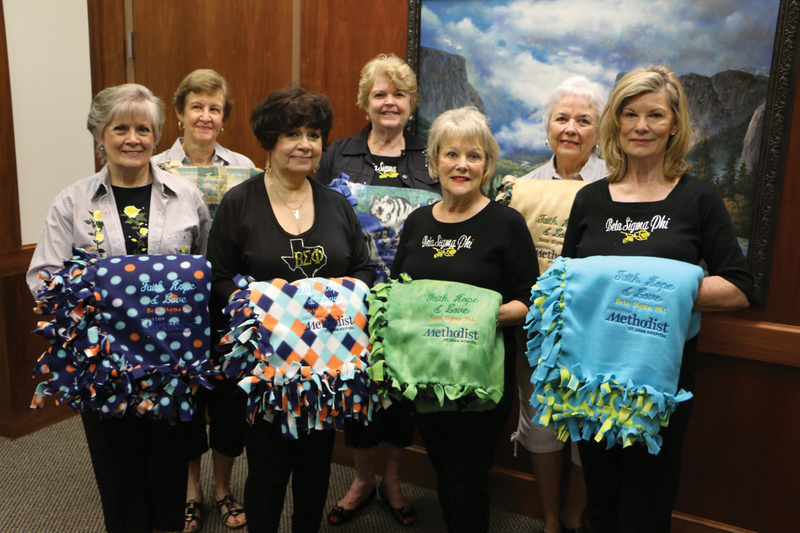 Along with other volunteer groups at the hospital, Coy-Tremant reports that over 200 blankets have been made so far this year for women with breast cancer, men and women with cancer and comfort blankets for their infants in need.